Some activists have decided to reject an invitation from the mayor’s office to attend the city’s Rev. Martin Luther King Jr. Peace Breakfast, citing unaddressed concerns of Chicago's African American community. 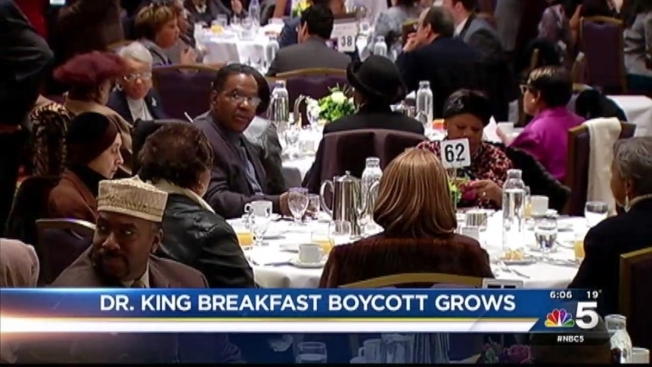 “I believe nothing can be more disrespectful to Martin Luther King than breaking bread with a leader who has damaged the quality of life for African Americans,” Jedidiah Brown told NBC Chicago. Brown said Mayor Rahm Emanuel has created a division within Chicago that goes against the teachings of the revered civil rights leader. “There’s not been any investment into the South Side of Chicago,” Brown said. Brown said despite asking Chicago leaders to provide peace to the city after the release of the Laquan McDonald video, the mayor has not delivered enough reform. “The mayor has caused more harm than good,” Brown said. Each year, the mayor's office invites city leaders to a ceremony and breakfast to reflect on the accomplishments of the civil rights pioneer and acknowledge his impact on American history. However, the events will take place this year as the mayor faces intensifying calls for his resignation over the city’s handling of the Mcdonald case. Emails recently released by the city noted that last April in the draft of the settlement with the teen’s family, attorneys for his estate argued they did not agree to what the city asked for -- hiding the dash cam video for years. However, the mayor has pledged reform and recently called for the city’s law department to be probed after a federal judge accused a former top city attorney of hiding evidence in a fatal police shooting.